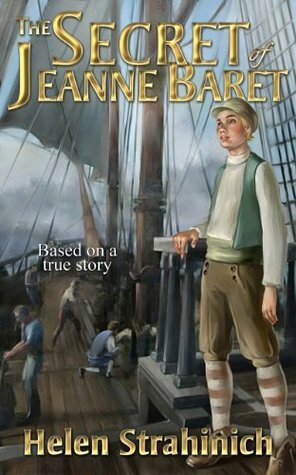 The Secret of Jeanne Baret is a young adult historical novel that tells the fascinating story of a French girl who embarks on a once-in-a-lifetime adventure: disguising herself as a boy to take part in a scientific expedition and, hopefully, to become the first female to circumnavigate the globe. The story is well researched. Jeanne (disguised as Jean) travels to many exotic locations, meets people from a fascinating variety of cultures, and as she assists her master with his work, learns that she has a real flair for botany. I think this book could be a wonderful way to show girls how exciting science can be. I had one minor issue with the story. At the beginning, Jeanne is very happy and thinks that she has achieved exactly what she wanted, so the early chapters didn’t have quite as much tension as I expected. Later, several complications arise: she makes an enemy among the crew, she narrowly escapes having her true identity revealed, and she even starts to fall in love with someone who has no idea she’s a girl. These plot twists help the story really move along. So I’d advise readers not to be fooled by Jeanne’s apparently perfect situation in the beginning. Keep reading. Once the action gets going, it doesn’t let up. Yesterday, I figured out a plausible back story for the protagonist of my next novel. Like The Ambitious Madame Bonaparte, this one will be based on the life of a real women—but this story is more difficult because she left her New England home to go west and then refused to talk about her childhood because of some unspecified break with her family of origin. Historians have not even been able to identify her birth family with complete accuracy because there are three different recorded birth dates for her and two different maiden names! Needless to say, this situation has both pros and cons. On the one hand, I get to make up her back story to suit myself, while on the other hand, the field is almost too wide open. It’s difficult to make choices that hang together properly. I’ve been struggling with it for several weeks and finally decided to read a history of the state where she grew up, which unfortunately, is one of the few states I’ve never even set foot in. Reading that book made a huge difference. I learned that the industry I thought dominated the state had all but died out by the time she was born, and something else entirely had begun to take its place. Then, about a week ago, I had an intuitive flash in which I “saw” this woman as a child in a distinctive setting. After that, everything fell into place. I now know how I’ll portray the events that brought about the unlikely occurrence of a single woman from New England leaving behind her well-established family and traveling alone to the frontier. This is for my indie author friends. 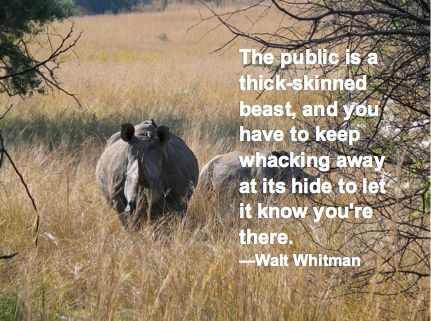 A little wisdom about marketing by Walt Whitman. Not much has changed has it? I’m really embarrassed at how infrequently I’ve been blogging. I’m well, but my attention has been focused on other things—mainly trying to develop a regular routine again. I’m working about 2/3 time, exercising regularly, marketing The Ambitious Madame Bonaparte, trying to get my garden in, and researching the new book. Blogging always seems to be the last thing on the list. The good news is that, judging from how much exercise I am able to do, I seem to have built my stamina up to my pre-cancer levels. However, that’s still not all it could be because, during the six months before the diagnosis, I was working too much and not taking care of myself. Hopefully, my energy levels will continue to improve if I stick to my program of healthy eating, regular exercise, and slow, very gradual weight loss. But I don’t want to minimize this milestone. Even though I still have a long way to go to meet my end goals, I’ve achieved something important in getting back to where I was before the cancer. I’m not going to make any promises about when I’ll be back to regular blogging, but I’ll try not to go a month between posts. Hope you are all well!